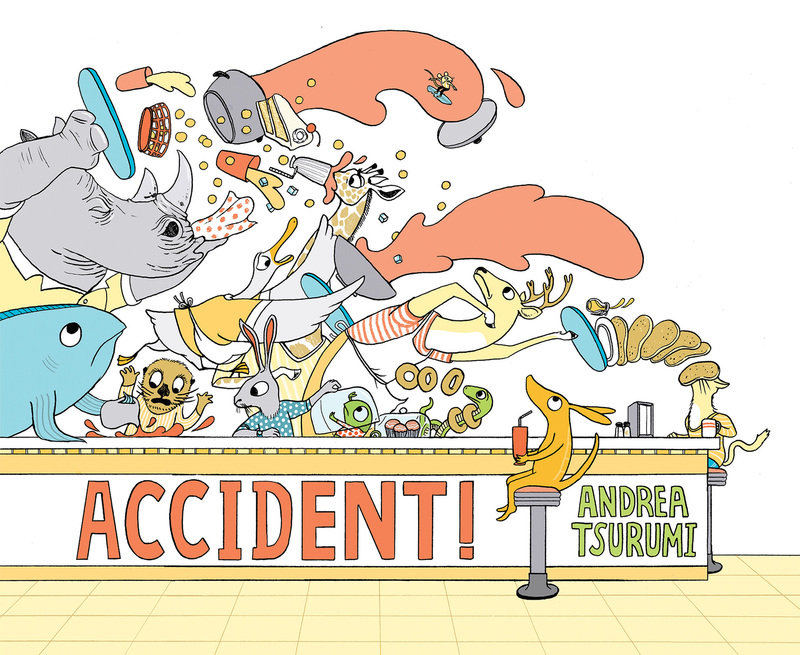 Comics fans have known Andrea Tsurumi’s work for years. 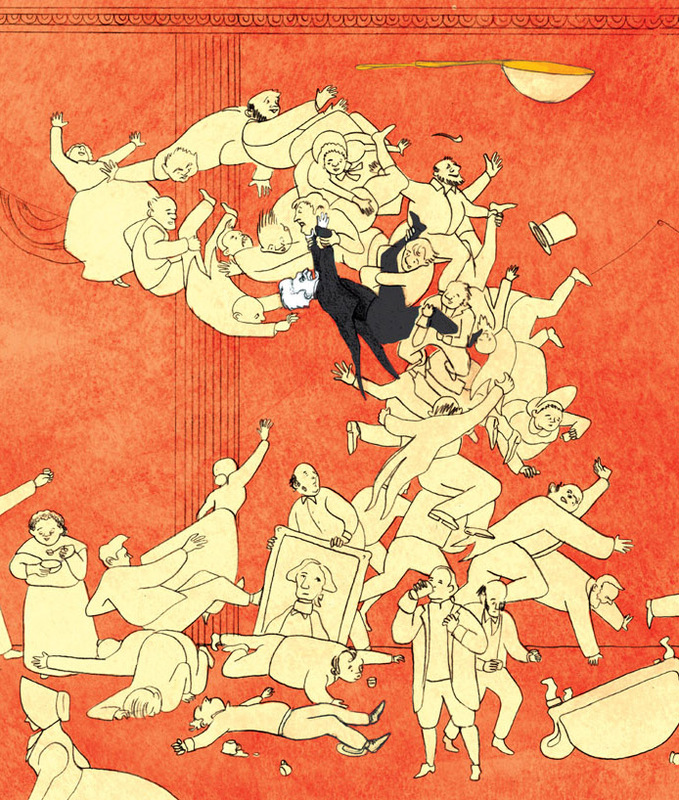 Comics like Andrew Jackson Throws a Punch and Zootrope, and her books Why Would You Do That? and But Suddenly an Octopus showed her inventiveness, and an ability to switch between styles. She’s made comics for The Nib, illustrations for The New York Times, and her picture book Accident! was just published by Houghton Mifflin Harcourt and has been named one of the best picture books of 2017 by Publishers Weekly. The story of an armadillo named Lola, it starts with an accident and then becomes an out of control chase that ends as people (and armadillos) learn a lesson. It’s something that will look and feel familiar to people who have read Tsurumi’s comics and is an entertaining, madcap story that feels very much like her work. She was kind enough to take time out to talk about comics, picture books and more. I’ve always been drawing, reading, and telling stories since I was a kid, and when I did tell stories they usually combined words and pictures. I just found the 2nd grade journal where my teacher asked us to log every day and it’s basically all diary comics. The comics I encountered growing up were fairly typical for that time – Archie, Tintin, Calvin & Hobbes, The Far Side, newspaper comics – but I didn’t really differentiate between comics vs. noncomics Instead, everything was story and everything usually combined words and images in some way (e.g. picture books, or the Illustrated Usborne Encyclopedia, or the marginalia comics in Cricket). What got me thinking specifically about comics as comics was Batman the Animated Series, because it ended in 1995 but I desperately wanted more of it, so in a blinding flash of the obvious, I suddenly realized I could go out and get more Batman comics, which took me to the comics shelves at Barnes & Noble, Borders, and the local library. In the last 90s, early 2000’s the comics offerings at those places were suddenly expanding and that’s how I got introduced to Hellboy, Daniel Clowes, and Chris Ware. Now, they must have a huge collection, but I think at the time, my public library just had some superhero comics and a large collection of Charles Addams and Jules Feiffer’s work, so I started reading them early on. Throughout all this, I’d still been drawing and writing and making comics for friends. I went to college knowing that I loved stories and wanted to tell them but had absolutely no idea how I was going to make that work. So I joined tech theater and learned about set design and performance and I studied literature and I met several close friends, including my now-husband, who also loved comics. By the time I moved to New York after graduation, I still had no idea how I would make it work, but I was drawing comics, taking comics classes with Tom Hart and Matt Madden, and going to shows like MoCCA. Accident! is my first picture book. It’s about an armadillo named Lola who knocks juice all over her parents’ best chair, PANICS, and runs away to the library (because they have books and bathrooms there and she can stay until she’s grown up). On the way, she gathers a group of similarly freaked out kids, all terrified by their various catastrophes. However, as they flee through town, they don’t see that everyone else is having their own personal disasters, too. It snowballs into a bonkers series of mistakes but then ends well with Lola learning about flaws and forgiveness. You’ve been making comics for years. People may have read your collection Why Would You Do That? or Andrew Jackson Throws a Punch. How did you end up making a picture book? Well, as I said in the first question, I grew up reading picture books and comics, but saw them as relatives in the same storytelling family and so I see it as exploring the same thing. For instance, my MFA thesis was a collection of books – Andrew Jackson Throws a Punch, a short comics anthology called Behold the Killbot, and a picture book But Suddenly an Octopus. 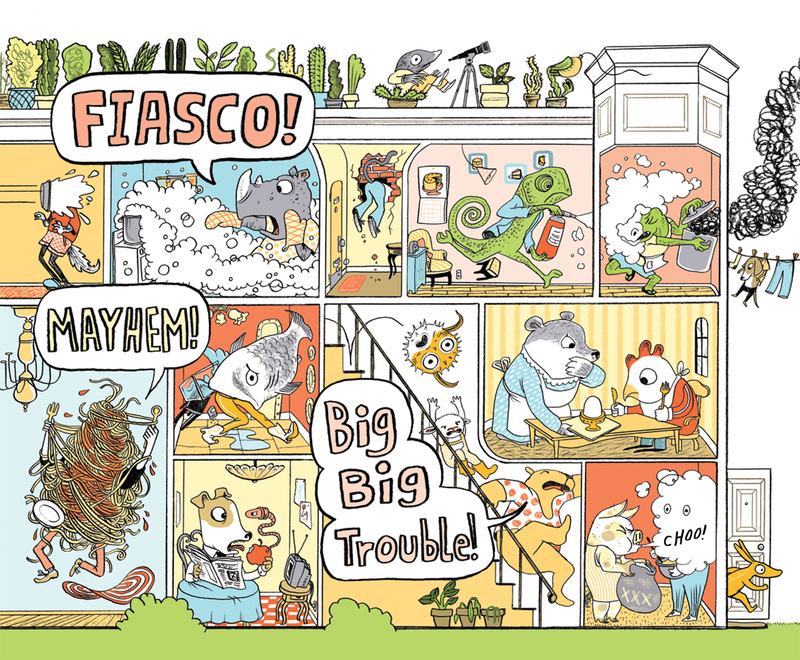 When I discovered European cartoonists like Joann Sfar, Lewis Trondheim, and Brecht Evens, I really responded to the way they play with text and image on the page that’s not rigidly panel-panel-panel, you know? My comics have a picture-book quality and my picture books have a comics sensibility, but really I think of it all as the same thing, just for different audiences. Accident!, But Suddenly an Octopus, and Zootrope all use speech bubbles and panels and play around with sequential form. In terms of how did Accident! itself happen – it was, appropriately enough, by accident. My grad school friends and I used to go to the kids book store Books of Wonder to hang out and do drawing jams and at one of these, my friend Nina Frenkel handed me the prompt “accident.” It was brilliant, it was perfect, and it led to a drawing that interested my agent, Stephen Barr, who asked me to develop it into a story. The grammar between comics and picture books is very similar but what were the biggest differences and challenges for you in terms of making the book? Making and self-published indie comics is total freedom: you’re your own art director, editor, and publisher. It’s great for experimentation, but it also means I was really self conscious when I started doing the actual picture book. I was worried what would be appropriate for the audience, I was worried whether the message was clear but not heavy-handed, and I was just generally worried that I was going to screw it up and fail at doing something that meant so much to me. Stephen and my community of illustrators and cartoonists reassured me that I should stop worrying about what I thought I was supposed to do and just work with the same sense of freedom that comics has. Once I got over that hurdle, it was easier to tackle the challenges of economy you encounter in a picture book. Everything that’s there needs to be there for a reason, and everything that’s not there should be absent for a reason. One reason I ask is that a lot of the energy of something like Andrew Jackson or some other comics where you’re not so much working with a plot but taking this idea and letting it snowball over the course of the piece, and you do something similar with Accident! Absolutely. Both are basically built around escalating chase scenes – one crazy dash to the payoff. Andrew Jackson was much simpler in that it was built to function as a narrative scroll (as you can see from the pull-out section). Accident! takes the same energy and ties it to a narrative point: the escalation reflects Lola’s feeling of panic; all the little disasters that happen around her as she runs show that she’s so focused on her own misery that she can’t see everyone else’s and it shows the reader that literally everybody is in the same boat. The disasters are high-intensity but they’re also meant to be funny – which undercuts the seriousness that Lola feels. And the resolution is something that the characters make happen for themselves in the end. I have to ask, why is Lola an armadillo? I loved the idea of Lola kind of “follow-the-bouncy-ball-ing” through the chaotic spreads. 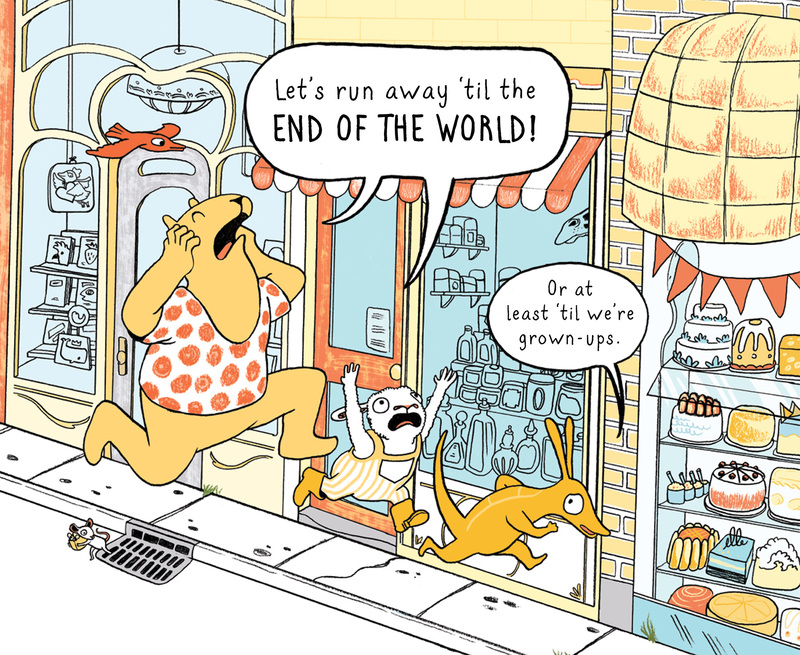 So have you left comics behind for good for the glamorous, exciting world of children’s books? Related followup – is the world of picture books more exciting and glamorous than comics? Not at all, I’ve always been driven to explore both since the beginning. Because children’s books have more of a mainstream readership than indie comics (and obviously a larger distributive reach and completely different publishing apparatus built around them), working on children’s books is also allowing me to focus on the personal comics that I really want to make. I’m looking forward to working on some ongoing daily-comics projects and also focusing on longer works. I’m still new in children’s books so I can’t speak to the relative glamour, but so far the people involved seem very similar: you find people who really, really love books and are willing to do quite a lot of difficult things to make them happen. So what’s next for you? What are you working on or planning? My second book, Crab Cake, comes out next year. It’s about a crab who makes cakes and about what to do in the face of overwhelming disaster.